I am pleased to present to you the review of Lorna Peel’s Historical Fiction Romance, Into the Unknown, coming out on May 5, 2015. (To preorder see links below). Set in England 1939, Into the Unknown follows young and naive, Irish Kate Sheridan as she arrives in London looking for work just as London is on the brink of war. Kate’s Irish accent and “drap” and “dowdy” attire quickly identified her nationality and she soon experiences the bitter words of English folk who treated her like a traitor, refusing her work and services as a result. It is an uncertain time for all, food is rationed, bomb shelters are popping up like wild mushrooms and children are being evacuated from their homes to the countryside. Traditional roles are changing as the future for many is fought both on the militarily landscape of Europe and the internal landscape of each man and woman. Residing at her aunt’s home, Kate meets a handsome and experienced Flight Lieutenant Charlie Butler. Drawn to each other like fire is to dry leaves, Kate and Charlie embark on a passionate and precarious relationship. Wanting purpose following the outbreak of war, Kate joins the WAAF, Women’s Auxiliary Air Force, where she develop friendships with other women serving to work with code, ciphers and other vital war operations. Charlie is stationed further away where he and his men take their fight to the air. Kate and Charlie’s love affair is threatened by prejudices, parental disapproval, other women and the war itself. Fighting to be together and fighting for country may prove to be too much for these young lovers. Into the Unknown takes readers into the private lives of men and women who fought for freedom on the shores of England while struggling to find a life, a love and a hope in a world that was ever changing and never certain. Will Kate and Charlie’s love be able to sustain the horrors of war? Is their love real or is it a shallow grasp for human connection as the result of the war? I found, Into the Unknown, an easy read that enlightened the hardships faced by the Irish living in England during the second world war. We have been educated on many other prejudices the world has faced and yet little is spoken about the internal prejudices the United Kingdom experienced while fighting against the horrific genocide and horrors the Jewish peoples endured during WWII. I love it when a novel brings to light something new or presents something old in a new light! 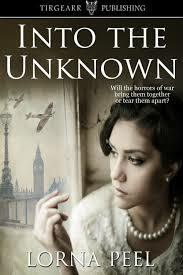 If you love romance, World War 2, and want a different perspective of this time period, then Into the Unknown is a novel you will want to read.